Energy technology company Enphase Energy has been building momentum in the Australian market with its Enphase AC Battery integrated energy storage system, designed for simple installation. 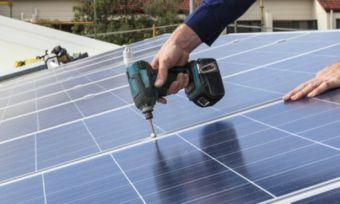 Enphase, which was founded and has its headquarters in California and which has offices in Sydney and Melbourne, describes itself as “leading the charge to bring smart, connected solar energy to every home, business and community”, offering a suite of solar products. What does Enphase Energy offer? Enphase’s offerings range from microinverters to its network hub and smart energy software, with Enphase having first unveiled its AC Battery, comprising part of its greater residential solar energy system, in 2014. In February 2016, Enphase unveiled an updated design for the AC Battery enclosure, providing for visual appeal (described as “clean, modern, unpretentious”) and ease of installation. In May 2016, Enphase advised that its authorised distributors had begun accepting orders from installers in Australia for its AC Battery, with the batteries subsequently commencing shipping in August. The demand from both installers and homeowners for the Enphase AC Battery in the lead up to its debut in Australia and New Zealand exceeded the company’s expectations. “Installers are telling us the Enphase Storage System offers the simplest installation on the market, and their customers are just as excited, with many paying for the system without even seeing it,” Enphase stated. What battery technology does the Enphase AC Battery use? Enphase states that its lithium iron phosphate battery “is simple to install, safe, very reliable, and provides the lowest lifetime energy cost for both new solar customers and retrofit customers”, with it having a minimum 10-year expected life. Additionally, the battery’s design provides for homeowners to tailor their system to their specific needs. The AC Battery’s modular architecture means you’ll get a storage solution that’s exactly what you need – no more, no less, no wasted costs, according to Enphase. “The system is easy to expand on as your needs change, as your family grows or you add an electric vehicle. Plus, flexible configurations work for any garage,” the company says. 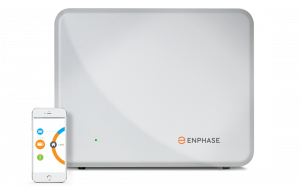 The Enphase AC Battery forms part of Enphase’s greater Enphase Home Energy Solution, which combines both hardware and software for smart energy management. The Enphase Home Energy Solution combines solar, storage and software that tracks your production and consumption, providing an all-in-one system that could maximise your energy savings while you’re busy living your life. Enphase states of its microinverters that they “offer the most advanced inverter technology on the market, which means higher production, greater reliability and unmatched intelligence”. Meanwhile, the MyEnlighten software provides mobile access, with an app available for both Android and iOS devices. Enphase states that MyEnlighten allows system owners to “track their energy production, monitor their system’s health and share their data with family and friends, all from a simple, mobile-friendly interface”. Enphase states that the AC Battery is simple to install, with it capable of “seamless integration with a wide variety of existing solar systems”. The AC Battery can be wall-mounted in an indoor, unoccupied space using standard AC wiring in a conduit or wall, with it measuring in at 390 x 325 x 220 mm (without brackets), weighing 25 kg. The modular size of each 1.2 kWh Enphase AC Battery enables installers to right-size each installation to match a homeowner’s unique energy needs, and gives them the flexibility to easily add more batteries in the future as energy usage changes over time. Meanwhile, the AC Battery provides for plug-and-play installation, with Enphase stating that the system will recognise a home’s existing solar system, regardless of whether it is or isn’t an Enphase system. “Beyond the physical components, Enphase’s proprietary Enlighten software means there is no need for tedious negotiations with third party software as is notorious in the case of almost all other systems that struggle to integrate with the software of the system’s other components,” Enphase says. In the event that a homeowner wants to scale up their system, Enphase states that additional batteries can be added without the need to pull out existing system components. Interested in buying an Enphase AC Battery? Consumers should consider all of their options when purchasing a residential battery storage system, and it is worthwhile talking to a number of different installers in determining the right system for a home. Consumers can search for installers via the Enphase website, which provides a search-by-postcode function, providing details on which installers are available in which areas.